Bamboo is an automation server that enables software developers to build automation into their projects by supplying plugins. Bamboo functionality can be extended using our new Netsparker Enterprise Scan Bamboo plugin. 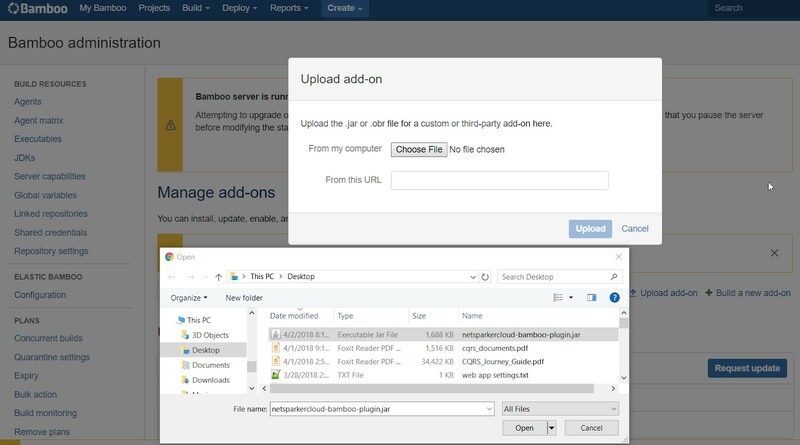 This topic explains how to use the new Netsparker Enterprise Bamboo plugin to integrate Netsparker Enterprise with Bamboo to enable our advanced integration functionality. The Netsparker Enterprise Scan Bamboo plugin is packaged into a jar file called netsparkerenterprise-bamboo-plugin.jar. This package has been tested and approved for Bamboo version 6.4.0+. Log in to your Netsparker Enterprise account. 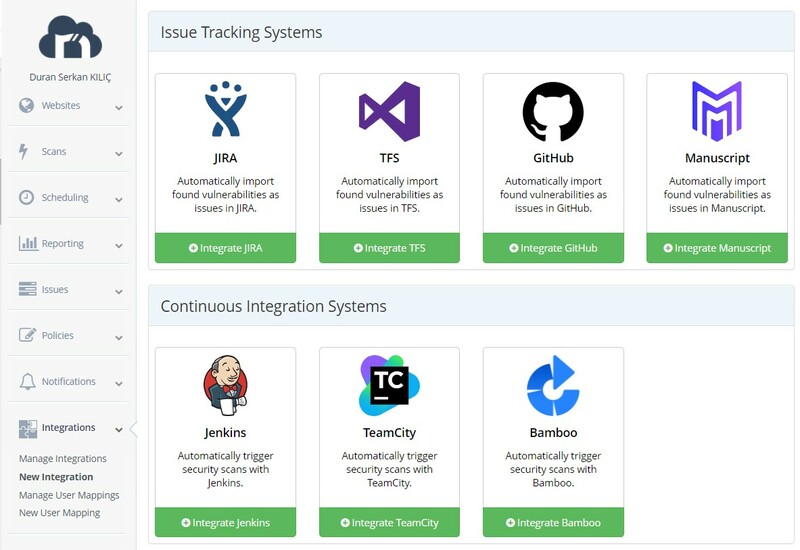 From the main menu, select Integrations, then New Integration. From the Continuous Integration Systems panel, click Integrate Bamboo. The Bamboo Plugin Installation and Usage window is displayed. Click Download the plugin, and save the file to a location of your choice. From the BAMBOO ADMINISTRATION dropdown, click Add-ons. The Global Settings window is displayed. From the Add-ons panel, click Upload add-on. The Upload add-on dialog is displayed. Select the netsparkerenterprise-bamboo-plugin.jar file you downloaded in a previous step, and click Open to upload it. The Upload Add-On dialog is displayed. Each Bamboo project has its own plans. Each plan has its own jobs which contains tasks. To use The Netsparker Enterprise Scan task, it must be added to a job. Open Bamboo. In the Administration window, from the Add-ons section of the main menu, select Netsparker Enterprise. The Global Netsparker Enterprise API Settings window is displayed. In the API Settings section, enter the API credentials: Netsparker Enterprise Server URL and API Token. From the main menu, click Projects. The Projects window is displayed. Click to select the project to which you want to add the Netsparker Enterprise Scan plugin. The project window is displayed. Click to select the plan to which you want to add the Netsparker Enterprise Scan plugin. The Plans window is displayed. Click Actions, then Configure Plan. The Configuration - Plan window is displayed. From the Stages tab, select a job to which you want to add the Netsparker Enterprise scan task. The Tasks window is displayed. Click Add task, then select Netsparker Enterprise Scan Task. The Netsparker Enterprise Scan Task configuration window is displayed. From the Netsparker Enterprise Scan Task configuration window, select the relevant Scan Settings. When the build has been triggered, you can view the scan results in the (under build results page) Netsparker Scan Result tab. Open Bamboo. In the Build Result window, click the Netsparker Enterprise Report tab. If the scan is not yet finished, a warning message is displayed. When the scan has been completed, the scan results from the NETSPARKER ENTERPRISE EXECUTIVE SUMMARY REPORT are displayed.